Restaurant marketing provides a number of unique challenges, yet most successful restaurants do well because they excel at the fundamentals. In this post, we’ll review what aspiring restauranteurs need to consider with their marketing so they can make it in this perpetually competitive business. Owning a successful restaurant is the dream of every entrepreneur who loves cuisine and service. You know you’re this type of person if every time you watch Diners, Drive-Ins, and Dives or Food Paradise, you fantasize about showing-off your success to the likes of wacky Guy Fieri. However, there is also a show called Kitchen Nightmares, where restaurants drowning in debt get help from caring but coarse Gordon Ramsey. Unfortunately, the majority of restaurants end up needing Gordon’s help instead of being worthy of Guy’s praise. 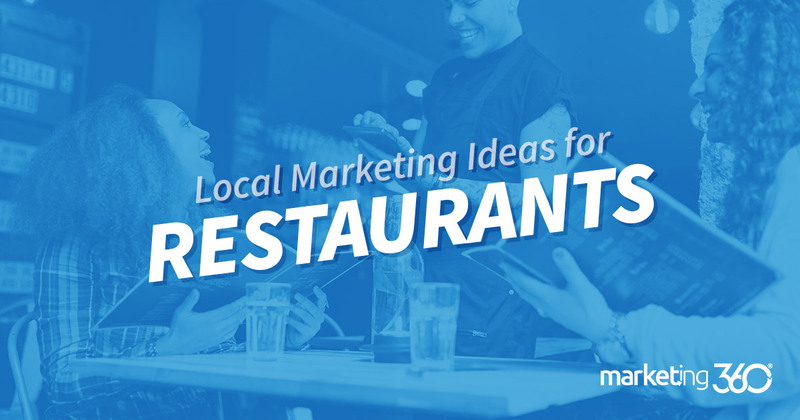 In this post, we’ll cover some ideas about how to make your restaurant a local hot spot. But more importantly, we’re going to talk about how to think about your restaurant – in its entirety – as the product you market. Because a restaurant isn’t just the food, drinks or staff. It’s not just about the location or amenities. Rather, it’s about the experience all those things come together to create. At Marketing 360®, we market for many types of businesses. But there is one thing we noticed that is a precursor to success, from local services to big eCommerce brands. The most successful businesses start-out with a product that’s designed to market itself. What this means is that the product is initially conceived and created so that people who like it will talk about it. Its popularity creates more popularity. Buzz creates more buzz. Word of mouth spreads naturally. Restaurants, in particular, are a business where the product is the marketing. There are all kinds of tactics you can use to advertise your restaurant and get the word out, from ads to social media posts. But you’ll never become the local hot spot unless locals are talking about you. Every restaurant owner knows this. But what many miss is the need to design this into their restaurant from the beginning. Many restaurants owners think “buzz” happens as an after effect. They think it’s all in the delivery. Chances are they don’t make a profit by serving a BLT with a pound of bacon on it. But this sandwich has such a great reputation that it draws in diners from all over the state. Every restaurant you see on Man vs Food that has an outrageous food challenge understands this. It’s a marketing ploy to create buzz for the restaurant – and one that can work. However, most restaurants don’t create buzz with outrageous food challenges, but rather with unique, well-crafted dishes that are a tasty value. So, creating a product that markets itself certainly starts with your menu. People need to enjoy the food. But that’s not the only thing that will help you market your restaurant. And most of the time, it’s not enough. In Denver, Colorado there is a restaurant that’s a local favorite. It’s been packing them in since the 1970’s and shows no signs of slowing down. This restaurant is the most successful Mexican food restaurant in the state, and maybe in the nation. So you’d be surprised to find out that this restaurant has a reputation for mediocre food – at best. In fact, at its location on West Colfax Ave, you’ll pass half a dozen small, local taquerias with much better food. Now it’s not likely you’ll design waterfalls, caves, and cliff diving into your local joint, but you get the point. When people go out to a restaurant, they want to experience a pleasant, energetic vibe. Most of the time, people don’t go to restaurants just to eat. They go for something to do – for entertainment that breaks up the monotony of the week. To create buzz, your restaurant needs to have that kind of vibe. Even the best food will have a hard time saving a dull, dated atmosphere. One of the biggest challenges to restaurant success is staffing. It can be hard just to find reliable, competent people. Harder still is finding the kind of staff – from front of house to back – that is so positive, energetic, and passionate about serving customers that they become the backbone of your restaurant’s success. But listen to Aaron Silverman, who started Rose’s Luxury in Washington D.C., a restaurant that was an instant hit and won best new restaurant in America by Bon Appétit Magazine in 2015. Interesting how they don’t look at resumes or hire on experience. Instead, they hire based on personality and fit with their culture. In doing so, they’ve countered one of the biggest problems in the restaurant industry: turnover. Restaurants run by families and that have loyal, long-term employees are more successful. It’s no mystery why. One of the key attributes of marketing a local restaurant is having ownership and staff that enjoy serving people. Their goal is to produce a meal and an experience that delights diners. Finding the right staff is a big challenge, particularly when it comes to attitude. People burn out working at restaurants, and many don’t see it as a career. Seek people who feel differently. Top notch, consistent service is one of the best marketing tools your restaurant can have. Kitchen Nightmares with Gordon Ramsey has a formula – and you should note it. First, he comes in and notices three atrocious things. It’s a formula for the show, but it’s also the reasons these restaurants struggle. When they do the relaunch, he’s worked on these things. He creates a tasty but simple menu that the kitchen staff can prepare with consistency. His design team comes in to revamp the decor to give the place a positive ambiance. He re-trains the staff (often reaming them in a tirade of f-bombs), sometimes firing people who are dragging the service down. With these changes, he gives the restaurant a chance. The goal is to get word out that the place has changed, and the experience is now worth it. There are many tactics you can use to market and advertise your restaurant. You need to have a well-designed, functional restaurant website for people doing searches and making reservations online. But in the end, the experience you create with your food, atmosphere, and people is your marketing. It’s what will create word of mouth, positive reviews, and loyal regulars. It all starts with the product you put out. You’re not just feeding people. You’re serving them and providing a fun, positive, satisfying experience. What will my customers tell their friends about my restaurant? The answer to that question is, in a nutshell, your local marketing.